release him into the wild once he was able to fly. before his death in 1996. To find out about another baby bird CLICK HERE. 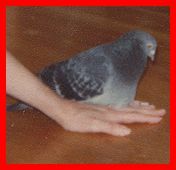 Bucky, our beloved pet pigeon who inspired our colorful website full of great things for kids.